Unitronic's Intercooler Upgrade Kit is a direct OEM replacement kit with the ability to support 600HP and more! Featuring a massive 20.5" x 4" x 8" bar and plate intercooler core made from T5052 aluminum, T6061 cast aluminum end tanks, proprietary internal fin and louver configuration, and a TIG welded construction, Unitronic's Intercooler Upgrade Kit will resist heat-soak and provide optimal and efficient cooling in any driving conditions. 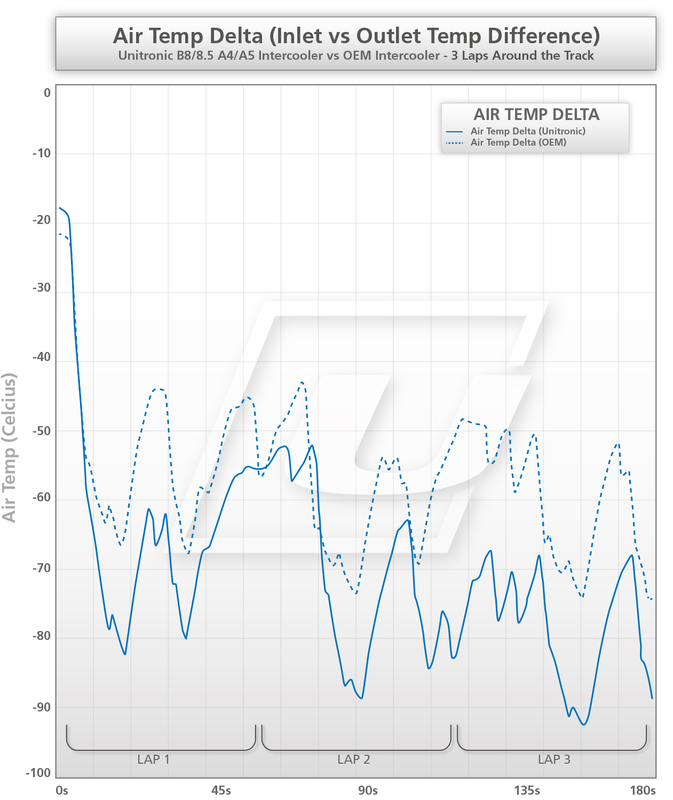 All data was collected on the same day, starting with the OEM intercooler testing first. Temperature probes were tapped into the inlets and outlets of both the OEM and Unitronic Intercooler core end tanks. 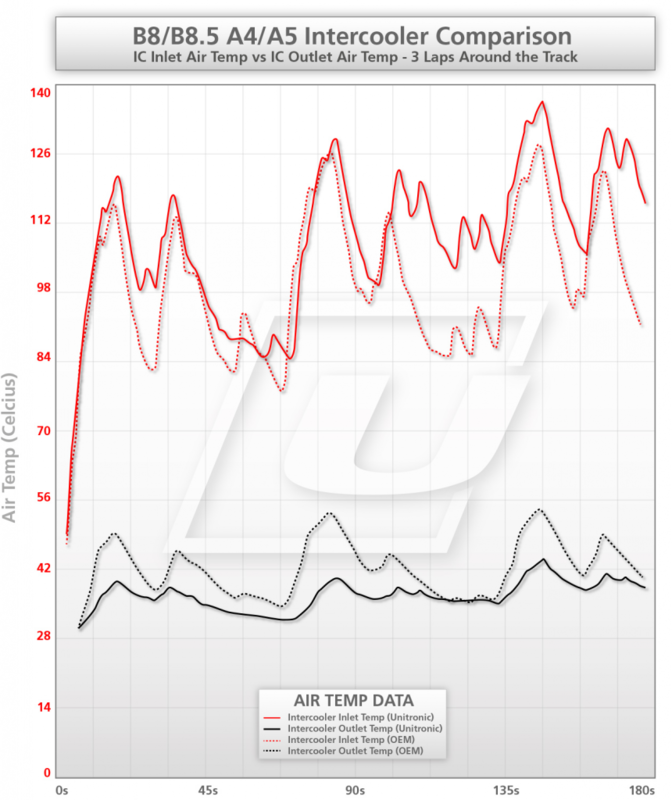 Ambient air temperature varied slightly throughout the day between 23-27 degrees Celsius (73-81 degrees Fahrenheit). Testing was done on the track, performing 3 consecutive laps around the circuit with both the OEM and Unitronic Intercoolers to collect inlet and outlet air temperatures to provide data on cooling abilities, efficiency, and resistance to heat soak compared to the OEM unit. Entering and exiting the core is an important aspect and should not be forgotten about. With implications regarding airflow as well as fitment, the end tanks are also something that Unitronic went through many working prototypes and production samples prior to it being approved for production. Unitronic’s T6061 cast Aluminum end tanks are designed with tolerances of +/- 0.020” to ensure perfect fitment across all of our production units, paying very close attention to its multiple OEM mounting points with the OEM constraints. Inlet and outlet design has also been optimized to ensure smooth airflow through the unit. Unitronic's Intercooler Upgrade Kit for the Audi A4 B8.5 2.0L TSI 2008+ is a direct OEM replacement kit. Using 3D modeling technology, Unitronic's Intercooler upgrade is a direct bolt-in upgrade that installs within a matter of hours. Basic mechanical knowledge and tools will accomplish the job.